I seen it at a convention and was going to buy it after I checked out other booths, since I always go with a budget. But when I got back it was gone. Sounds like a fun game though. Yeah it's one of the best 1 versus all board games out there. I did the same thing and held off buying it because it was $90 at the time. I think that's what a lot of people did so it didn't sell as well as it should have. I'd definitely recommend it if you're into Doom or board games like this. Hey man that's awesome at least you were able to enjoy the game. It's a shame about your group splitting up though. Honestly I would try to find like minded people on meetup.com or something. I have two friends who I play board games with every Friday. We are trying to corrupt one of my friends roommate into playing board games with us. It's an acquired taste for people who have never played anything better than garbage like Monopoly. Me n my girlfriend played this a couple years back when it was released and couldn't really get into it. I think our issue was that we played it 2 player, where as games like these require a decent sized group to really be any fun. The miniatures that it comes with are excellent though. We actually prefer the old Doom 3 version even though its a little less polished maybe. We used to really enjoy writing up our own missions with narratives. I think it would be fun either way. We have only done 3 players so far. I can see what you mean though because a larger group would definitely make Doom even more enjoyable to play. I never tried the Doom 3 version but that's baddass creating your own missions and such. If you're still on what kind of story did you give your missions? A....Doom board game...look, I don't mind board games but I don't see how this works. It's understandable if you're not really into board games. One player takes control of the demons while up to 4 other players each control a marine. There are 12 re-playable missions where the marines are trying to accomplish their objectives while also picking up new weapons, grenades, and health packs. The demon player needs to slow the marines down and usually needs 6 frags to win. It's an all around good time with your buddies. There's a part of me that wonders if it would be possible to turn that dynamic on its head. 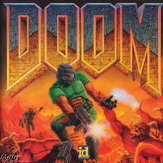 Instead of one player controlling all the demons, and all the other players teaming up as marines to achieve a shared objective, consider a game where one player controls the nigh-unstoppable Doom Slayer and the other players share control of the demon horde. I think you'd need to scale the strength of the Doom Slayer according to the number of demon players - not necessarily "the Doom Slayer is twice as strong versus two demon players as he is versus one demon player," but some other way of changing the dynamic so that the game plays quite different as you add more demon players and a larger or faster-growing demon horde. The Bioshock Infinite board game had a cool dynamic where Booker and Elizabeth (the main characters) were actually not controlled by a player while the two warring enemy factions were player controlled. 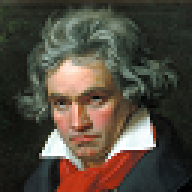 You would try taking over a piece of land from the other player and there's a chance Booker would come and make life hell for both of you if the RDM made it so. Made the game interesting and play out in a way no player could really directly control. I didn't even know the demons were player controlled in the Doom board game, I thought it was strictly PVE? Or was that the Doom 3 board game? I've been getting really into board games these last couple years as getting together with long time friends is half the fun. Playing stuff online with them is like an everyday thing while playing board games is a rare treat. It helps that all our wives/girlfriends will all play a board game too but typically not a video game. I'll admit that I have no personal experience of this; I'm just going by how @dm5k described it above. Your description of the Bioshock Infinite board game makes it sound pretty cool; I'm sure there are some potential player who'll be disappointed that you're not getting to play as the heroes of the video game, but I actually like the fact that they've taken the setting and then gone with gameplay that has you doing something quite different. That sounds like the old Games Workshop game of Space Hulk, which was a stupidly fun board game and an okay PC game. 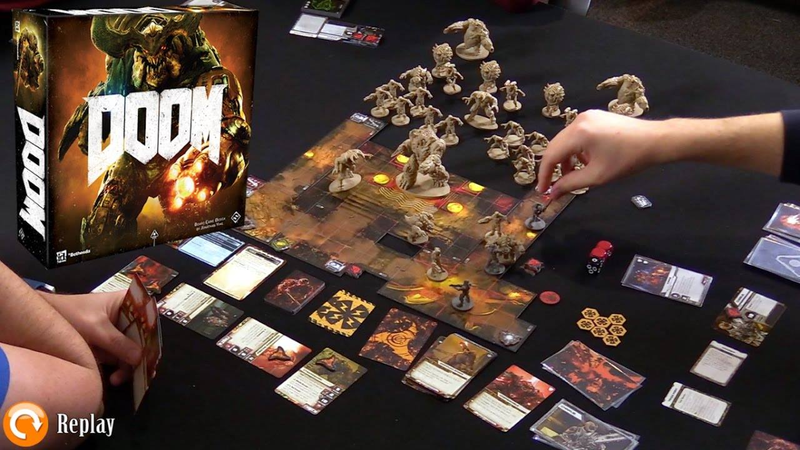 I never played the Doom 3 board game but from what I understand the newer 2016 version is a more streamlined version. And it's definitely a PvP game. I'm very jealous you and your friends have wives/girlfriends to play board games with. All the same I'm happy with my small gaming group. Something like this might be possible but the game is designed for only one demon player in mind. The marine side can play with just one marine but the game can be unbalanced if not playing with all 4 marine figures. 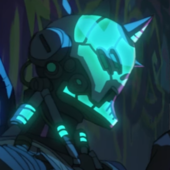 In the solo marine version he gets more health and abilities to compensate but this also makes him very difficult to take down as the demon player. Each side has a deck and hand of cards. The marines have weapon cards to play when they are activated. While the demon player has a large variety of cards to hinder the marine players. Each demon type has its own card that is kept on the game table to show what demons are currently in play. When a specific demon say like imps are activated then ALL imps on the board can move/attack. Like how role playing game is really roll playing game, since you roll the dice. You play a role in every game.